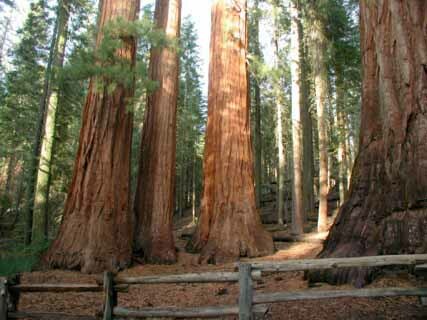 Located just a few miles inside the South Entrance to Yosemite, the Mariposa Grove is an amazing grove of ancient Redwoods. This rare stand of "big" trees was a favorite site of John Muir, who worked tirelessly in the early 1900's to protect these beauties from the ravages of the loggers, and finally convinced Pres. 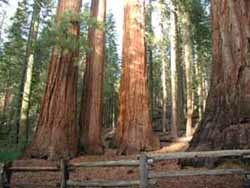 Teddy Roosevelt to include them in the park for all to enjoy. Years ago a simple road would enable you to actually drive through the grove (and even right through a large hole that had been sawed right through the base of one of the behemoths, until it fell down in 1969!). Wisely, this road is no longer open to private vehicles, but you can hike or stroll through the grove at your own pace (kids love this adventure!) or hop on the Park-run tram that winds its way through the grove, providing a ranger-narrated tour and a very up-close look at these towering behemoth wonders. An amazing experience for all ages. Located about 30 minutes inside the South Entrance to Yosemite, Wawona has a rich history and offers a lot of fun choices for visitors to the park. Cabin 3N is located in Wawona and from the cabin you can hike to Chilnualna Falls (and then hike the trail leading up the falls if you're in shape!). During the summer, a swim in the Merced River is always a refreshing treat (June - August are the best months). There are at least 4 "swimming holes" along the river in Wawona or you can just hike down the boulder-strewn river and find your own perfect swimming spot. One of the favorite swimming areas is at the "hanging bridge" (a short drive along the south side of the Merced, or you can hike to the bridge from the cabin - see the Redwoods Front Desk for directions to the trailhead). A Visit to the historic Wawona Hotel (site of of the filming of the old "36 Hours" movie staring James Garner) is a must. The hotel has been in business since the 1860's and was built on the site of Galen Clark's original stage coach stop. The hotel serves sumptuous meals, and during the summer months hosts an old-fashioned BBQ on the expansive front lawn. Don't miss the intimate and engaging evenings with singer/piano legend Thomas Bopp as he entertains visitors in the hotel's parlor, with his endless selection of piano favorites and stories from a bygone era (check with the hotel for dates & times of Mr. Bopp's performances). Across from the hotel is the legendary Wawona Golf Course. Built in 1918, this beautiful 9-hole, par-35 course winds its way through the meadows and forest and provides a lush and breath-taking experience that has been challenging golfers for decades. 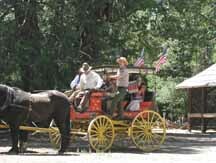 Also take a stop at the Pioneer Village in Wawona. This historic site contains a collection of early cabins that have been rescued from throughout Yosemite and re-assembled into an authentic village that is open for free tours by the public. From an early settler's cabin, a Wells Fargo office, and an artist's studio, to a stone jail complete with leg irons!, you and your family will have fun exploring these vintage Yosemite log cabins and learning the history of early Wawona and Yosemite. 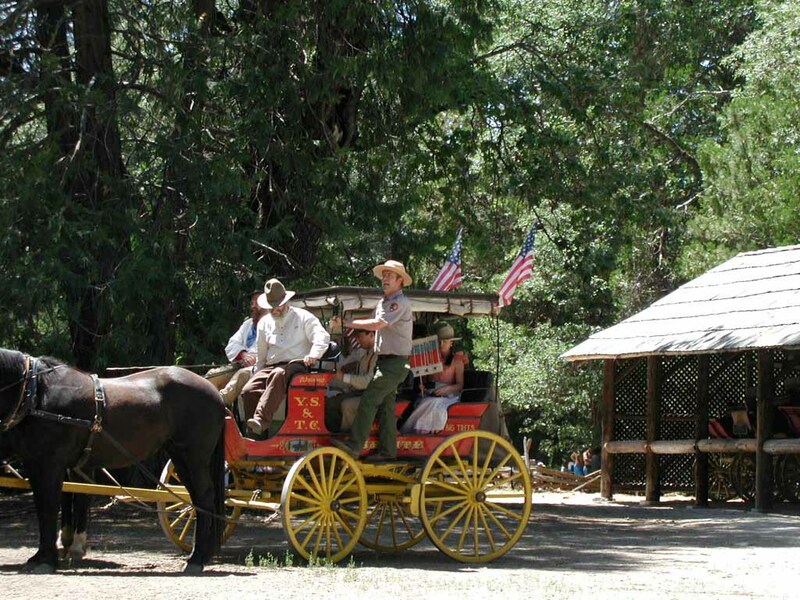 During the summer months you can even hitch a ride on a real stage coach (see inset photo) that will take you on a short and dusty trip around the Pioneer Village, then through Wawona's covered bridge across the Merced River to the Wawona Hotel, and then back to the Pioneer Village - kids and history buffs will love it. About halfway into the drive from Wawona to Yosemite Valley (about 12 miles after leaving Wawona), make a right turn onto Glacier Point Rd to begin the winding 15.8 mile drive up to Glacier Point. At 7200 ft., this amazing vista offers spectacular views of Half Dome, El Capitan and most of Yosemite Valley. Bring your camera because you'll find endless opportunities for the "perfect shot" of many of Yosemite's most famous and picturesque landmarks. Until it burned down in the 1950's, a wonderful old wooden hotel provided refreshments and souvenirs for visitors, but today the area is wonderfully natural, so bring your own picnic lunch! Yosemite Valley is obviously the "heart" of Yosemite National Park, and spending a day or two exploring its wonders is an essential part of any trip to Yosemite. 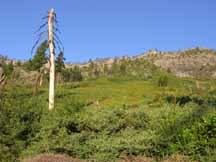 Located about 1 hour North of the cabin, via scenic Hwy 41 (which follows the route of the original stage coach road into the Valley), the Valley makes a great day trip from Wawona. As you approach the Valley, the highway will lead into the historic Wawona Tunnel which is the gateway to the Valley. As you drive through the tunnel, start to slow down, because at the end of this passageway is a spectacular lookout point that you can visit by making a left hand turn into the parking lot about 100 ft. after you exit the tunnel. The vista from this turnout is breathtaking, and the views of Half Dome, El Capitan and the falls will provide a magnificent backdrop for some memorable photos of the whole family. As you continue on the road leading down to the Valley floor, you'll be bathed in cool shade as you wind your way through the forest of douglas firs, cedars and sugar pines. Deciding what to visit first can be overwhelming, but one of our favorite locations is the meadow. 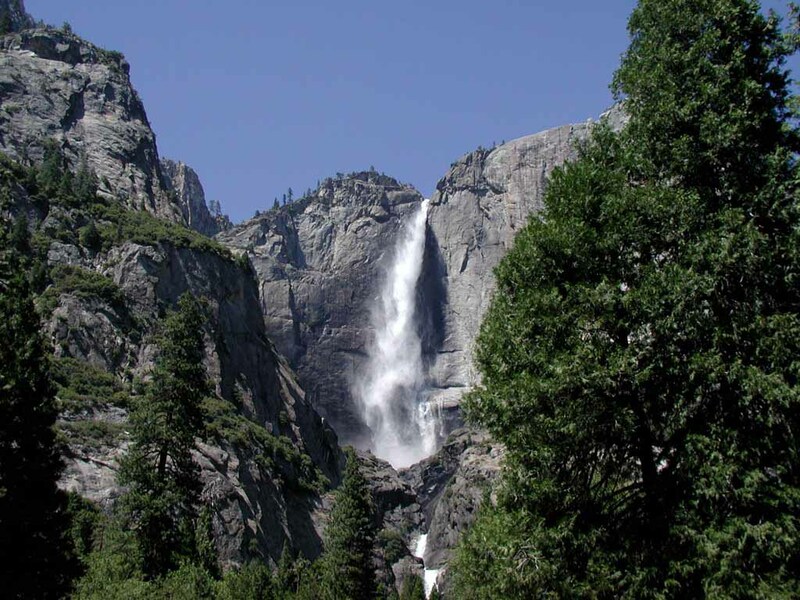 Pull over and park along the side of the road and marvel at the towering granite walls of the valley and lacey waterfalls (Upper and Lower Yosemite on the left, and Bridalveil on the right). The grandeur of Half Dome is straight ahead. Lots of photo opps and inspiraton here. The Valley is about 7.5 miles long. You can only drive through about half of the Valley, but frequently running free trams are provided by the Park, and will give you access to just about anywhere else in the Valley you want to go. Hundreds of books have been written about Yosemite Valley and its amazing and accessible sites and scenery, so before your visit to the Park you might want to pickup one of these guides. 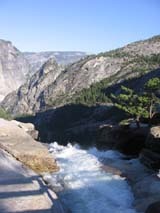 The Valley offers just about any activity you'd care to experience; countless hiking possibilities, swimming and "floating" down the Merced River, the hike up the Mist Trail past Vernal Falls, then Nevada Falls (if you're brave and in great shape you can even continue on this trail up to the base of Half Dome and climb "cable steps" that lead to the top of the granite Dome - but don't attempt this in a thunderstorm!). Or you can leisurely explore the park, by renting bikes and riding throughout the Valley on paved, mostly level, bike trails. Whether you're into history, nature, hiking adventures, photography or just want to have a laid-back picnic lunch in beautiful surroundings, the Valley truly has something for everyone. After a full day spent in Yosemite Valley, you'll be ready to head back to the cabin for a BBQ and restful night. But if you really crave nature, you'll want to plan a trip for the next day, to Yosemite's high country; Tuolumne Meadows (pronounced "ta-wallow-me"). 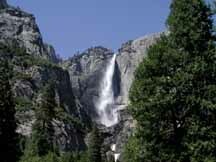 To reach Tuolumne, you'll leave the cabin and head for Yosemite Valley again. 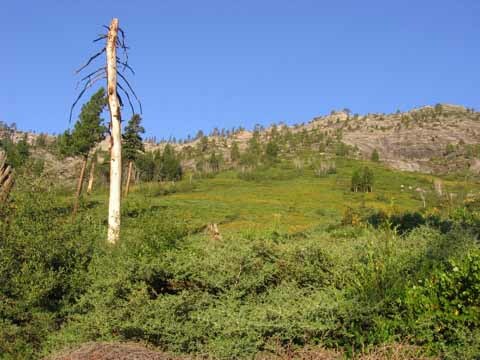 You'll follow the road through the West end of the Valley and take SR-120 (Tioga Pass). This highway will take you by the Hetch Hetchy Dam (which provides water for San Francisco residents) and through beautiful scenery as you climb higher and higher into the "alpine zone". About 32 miles after leaving the Valley you'll come to sparkling Tenaya Lake which is a great stop for a picnic and even a swim in the lake if you don't mind chilly water! Tuolumne Meadows is refreshingly undeveloped so you won't find restaurants, lodges, souvenir shops and soft-dip ice cream. 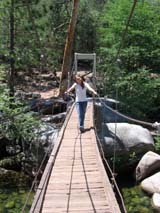 What you will find are hundreds of acreas of pristine high country, hardy alpine pines, granite outcroppings, natural meadows, icy cold streams and brooks, natural picnic areas and countless hiking trail choices. This really is unspoiled high-country and when winter comes, the road leading to Tuolume is buried under snow and closed to traffic until the spring thaw. Yosemite is truly an all-season destination that even has a wonderful ski resort. Opened in 1935, this classic Ski Area provides a great "family-friendly vibe" with access to a wide range of slopes & terrain for the first-time beginner as well as intermediate and black-diamond skiers and snowboarders. The mountain is served by 4 lifts plus a handle-tow for beginners. Amenities include equipment rentals, professional instructors and a choice of dining locations and styles all provided in a "laid back" atmosphere. Whether you have down-hill skiers, cross-country skiers or snow boarders in your family, everyone will have a blast at Badger Pass, and a day spent on its slopes will really be a great "focal point" for a winter family vacation in Yosemite. Badger Pass is located about 5.5 miles up Glacier Point Rd. on the road that leads to Glacier Point. Absolutely nothing says "family vacation in Yosemite" like an authentic "evening program" presented by one of Yosemite's engaging and knowledgable Park Rangers. These programs are really a throwback to a simpler time and the whole family (especially the kids) will be entranced by the presentation. On any given night, the Ranger may present a talk about earthquakes in the park, bears and other wildlife, the lives of Native Americans who lived in the area long before it became "Yosemite National Park", or one of a myriad other topics they may be interested in. So bundle up and prepare to share an enjoyable and entertaining evening with your family at one of the many free"Ranger Talks" that are presented by the Yosemite Rangers during summer evenings at the Wawona Campground, a short drive from the cabin on Hwy 41. This just may be your kid's favorite memory from your Yosemite Vacation!